Nguyen Thi Huong Lien (fourth from left in photo) started women-led motorcycle tours in Hue City, Viet Nam in 2014. She has since expanded her business to four more cities and is eyeing other markets in the Greater Mekong Subregion. Photo: I Love Asia. Mekong Innovative Startups in Tourism is helping develop responsible and sustainable tourism in the Greater Mekong Subregion. 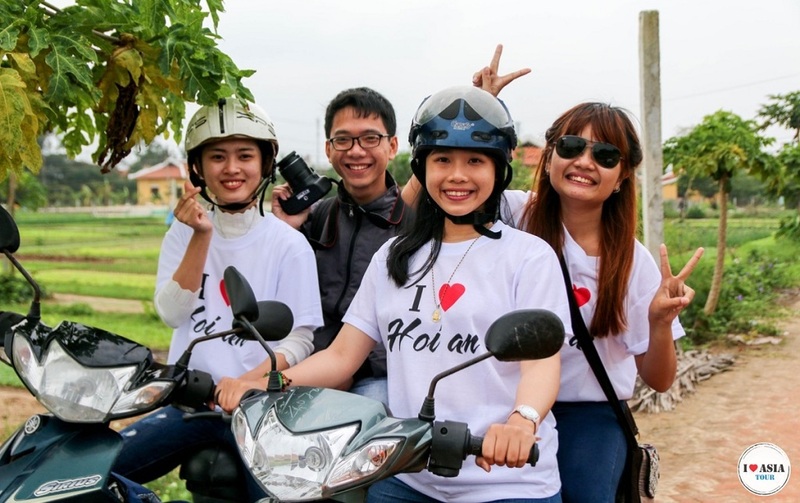 Nguyen Thi Huong Lien, 25-year-old founder of “I Love Asia,” offers motorcycle tours led by women while supporting projects for disadvantaged communities. She is one of the entrepreneurs supported by a tourism accelerator program in the Greater Mekong Subregion. Mekong Innovative Startups in Tourism (MIST) supports innovation-driven enterprises engaged in travel and hospitality that have potential to contribute positively to local communities, economies, and the environment. It is a project of the Mekong Business Initiative, which is supported by the Asian Development Bank and the Government of Australia, and the Mekong Tourism Coordinating Office. To help facilitate dialogue on private sector development policies and regulations, MIST has connected startups to incubators, investors, and governments in the Greater Mekong Subregion, one of the world’s fastest-growing markets for tourism. While in her third year at university, Lien wished to hone her English skills by serving as a tour guide and offering immersive, local, cultural experiences to travelers. She started motorcycle tours in Hue City in 2014, which is a popular way of exploring Vietnam. To spread the word about her motorbike tours, Lien invested less than $100 in learning social media, digital marketing, and web development. After seeing her client base expand with the use of digital technology, she knew that her tourism startup—then known as “I Love Hue” —had good prospects of achieving growth. The company now offers tours in five cities in Viet Nam, making an even greater impact with its growing presence. Lien employs female university students, who receive training on digital tools and leadership. As a proponent of innovation and women’s empowerment, she is deeply invested in advancing skills that are critical for her lady bikers to make their mark in the digital age. Core to the company’s mission is its commitment to building a better world through tourism. The business has cultivated partnerships with orphanages and social development centers, where Lien and her fellow lady bikers conduct their charity tours. Just recently, Lien launched a foundation to further support community projects, using a portion of sales from the company’s touring services. In 2017, Lien applied for the MIST Startup Accelerator Program and became one of the recipients of financial support and mentoring. MIST paved the way for her networking with other businesses and participation in international conferences. “MIST gave me exposure to businesses in tourism. In my interactions within the MIST network, I received strong encouragement, motivating me to realize my vision,” Lien recalls. Beyond Viet Nam, Lien is eyeing expansion into other Mekong countries. Her business is in the process of being set up in the Lao People’s Democratic Republic, and MIST connected her with local networks during the initial planning stages of her entry to this new market. Looking ahead, she hopes to extend her social footprint in Cambodia and Myanmar, staying true to her passion to transform the world through travel. The Asian Development Bank and the Australian Government jointly launched the MBI in 2015. The MBI catalyzes private sector development in emerging ASEAN markets, focusing on Cambodia, Lao PDR, Myanmar, and Viet Nam. The program aims to improve the business-enabling environment in these markets with particular focus on business advocacy, alternative finance, and innovation.